OUR divine Redeemer, being in Galilee about a year before His sacred Passion, took with Him St. Peter and the two sons of Zebedee, Sts. James and John, and led them to a retired mountain. Tradition assures us that this was Mount Tabor, which is exceedingly high and beautiful, and was anciently covered with green trees and shrubs, and was very fruitful. It rises something like a sugar-loaf, in a vast plain in the middle of Galilee. From it’s summit one can see Nazareth in the distance. This was the place in which the Man-God appeared in His glory. Whilst Jesus prayed, He suffered that glory to diffuse a ray over His whole body. His face was altered and shone as the sun, and His garments became white as snow. Moses and Elias were seen by the three apostles in His company on this occasion, and were heard discoursing with Him of the death which He was to suffer in Jerusalem. 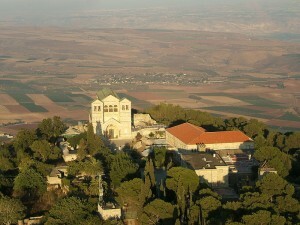 Aerial view of the Church of Transfiguration at the summit of Mount Tabor. The three apostles were so awestruck by this glorious vision that St. Peter cried out to Christ, “Lord, it is good for us to be here. Let us make three tents: one for Thee, one for Moses, and one for Elias.” Whilst St. Peter was speaking, there came, on a sudden, a bright shining cloud from heaven, an emblem of the presence of God’s majesty, and from out of this cloud was heard a voice which said, “This is My beloved Son, in Whom I am well pleased; hear ye Him.” The apostles that were present, upon hearing this voice, were seized with a sudden fear, and fell upon the ground; but Jesus, going to them, touched them, and bade them to rise. They immediately did so, and saw no one but Jesus standing in his ordinary state. This vision happened in the night. As they went down the mountain early the next morning, Jesus bade them not to tell any one what they had seen till He should be risen from the dead. Reflection.—From the contemplation of this glorious mystery we ought to conceive a true idea of future happiness. If this once possess our souls, we will think nothing of any difficulties or labors we can meet with here, but regard with great indifference all the goods and evils of this life, provided we can but secure our portion in the kingdom of God’s glory.